"For most small boys – especially those growing up in Britain – the Maldives were one of those series of dots on the atlas colored pink, denoting their allegiance to the British Empire. 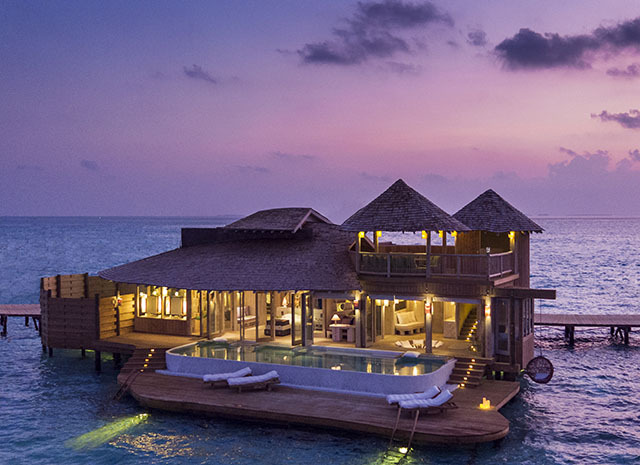 Decades later as the Maldives blossomed into a budding tourism destination, the first name I heard was Soneva Fushi. Now I know why. In simple terms the sophisticated American traveler can jet hours to the middle of the Indian Ocean to select from a slew of international brands – or they can truly stay “in the Maldives” with Soneva. It’s a no brainer." Soneva was founded in the 1990s by Sonu and Eva Shivdasani (hence “Soneva”) in a quest to create resorts that blend into their surroundings, provide every possible amenity and exude a sense of calm, authenticity and sustainability which they call “Slow Life.” The resorts’ trademark is “no news, no shoes,” and as travelers approach each Soneva resort, shoes are removed and placed in cloth bags. The TVs in the suites just play music but, in a bow to the 21st-century inevitable, if you really must be connected, wifi is everywhere and super fast. Soneva Fushi was the brand’s first resort, followed by Soneva Kiri on the Gulf of Thailand, ideally located for excursions to Angkor Wat. Soneva in Aqua, moored in the Maldives, provides a luxurious yacht experience and, in the fall of 2016, Soneva Jani—a stunning over-water resort–opened in the five-island Medhufaru lagoon in the Noonu Atoll. Without descending to wasteful hyperbole, it is one of the most extraordinary resorts in the world.